With an ever-changing society using technology devices in almost every atmosphere of life, educators are left with an overwhelming question. The question may seem simple to other but when it boils down to the accountability of a teacher, how the students learn and how the teacher can teach the students to make sure they understand the lesson, choosing a common core knowledge instruction based method or 21st century skills instruction method becomes baffling. The Common Core Knowledge Foundation started by a professor at the University of Virginia is very well thought of and organized. Sequence knowledge plans for the 7th grade, including English, history, science and math are very well detailed, giving exact knowledge that students need to learn in order to move to the next grade. This idea reminded me too much of a traditional approach to learning, as John Dewey stated in his Experience and Education book, as well as a SOL curriculum guide. With the common core knowledge foundation there are strict common cores that teacher must teach students. It leaves no room for outside experience, real data, or relating the lesson to something outside of the classroom. It follows the idea of a traditionalist model that students will learn x at this given time. There is little to no room for more emphasis on a subject, or time to be taken for students who do not understand this method of teaching. It’s critical that a teacher can develop different ways to teach his/her students, however with this model of instruction it seems to rely on lecture, notes and a textbook to teach the lesson. What if students cannot learn this way? What if they need to be able to see this lesson play out in History, maybe a student can’t just say the civil war happened without knowing all the details leading up to the Civil War. The common core foundation sequence does not allow for a self-guided individual. How will this help students prepare for the real world? Those who cannot work together, be self-directed or interact with others in a learning or workplace environment will surely lose a job to other candidates. P21 seems like a promising instruction method. The website offer detailed information, examples, charts and guides to how instruct lessons to ensure that the core subjects, innovative skills, technology skills and life and career skills are present in every class, in every grade. 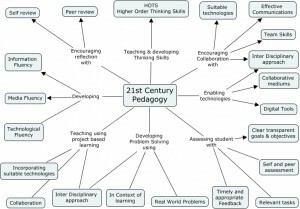 P21 reminded me very much so of a Progressive Model of instruction. With P21 you have real world data; the teacher is teacher through outside sources (one lesson showed that an outside expert teachers a lesson on business once a week and the students develop their own product to sell over a semester), students are actively engaged in how they learn and work as a team with peers and their teacher to learn everything they need. Critics state that the P21 foundation does not teacher the core knowledge that is essential to being “smart”, but how can smart be measured? Is it passing grades, or is it knowledge that the student can carry with them once they graduate to use to help achieve a career? P21 focuses on using technology due to society at this given time. If we look back to the Harrison School example, this is essentially what that school is doing. The video showed the students engaging in learning about the subject through real world examples (throw of the softball pitch, speed of cheerleading drop, etc). This example seems to stress the idea that technology is essential in today’s world in order to compete for a job. I know from experience that most interviewers ask “can you work in a team”, “do you know how to operate a computer, the internet, Microsoft tools”, and sure one could google how to use these tools, but if you learn them in a classroom it is bound to carry with you all your life. I think the P21 method would allow for more room to learn and adapt in today’s world. Since History is my subject area, I think it’s important for students to have some type of common core knowledge, that way especially in alignment with the SOLS, students are guaranteed to learn the skills that the need in order to pass the SOL. 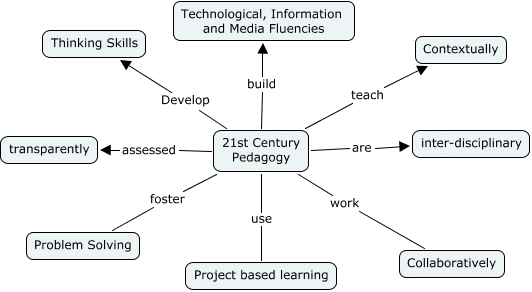 However some type of 21st century skills should be incorporated into the learning process. It’s especially hard to decide between a strictly 21st century learning style or a common core learning style because of the accountability on myself as a teacher. Of course I would love for my students to be actively engaged in my classroom. I would love for them to be able to use research tools, podcasts, video software and smartboard everyday; however I do not know if they would be learning exactly what they needed to learn. Upon talking to other students History is one of the most boring subjects. It would be up to me to involve the students as much as possible, but I need to be aware of how students learn, and process information. Perhaps with some lessons a lecture and notes is essential, but then a mini-lesson of the same subject can be used through some technology resource in order to reinforce the idea and present it in another way for students who cannot simple learn by taking notes. Dewey, J. (1938). Experience and education. New York: Macmillan Publishing. (n.d.). Reading standards for literacy in history/social studies 6–12. [Print Photo]. I focused on watching the Social Studies examples. One that I particularly enjoyed and thought was engaging to the students and the teacher was the example of Authentic learning in the entry level. This example showed students using a smart board to learn more about longitude and latitude in order to strengthen their geography vocabulary. The teacher chose a certain day for the students to work on geography, outside of their traditional world history lessons. The teacher instructed the students where the hurricanes occurred, and then the students plotted those points onto a map on the smartboard using the hurricane’s longitude and latitude points. All the students were engaged and were given a chance to find the information and to plot it on the smartboard. This lesson allowed for the students to see firsthand how geography can relate to the real world rather than just reading about the terms in a textbook. In a grade 9-12 examples for social studies, a teacher used an online world history textbook. This was found under the collaborative learning entry level on the matrix. In this classroom students were given their textbook and their own laptop and they were instructed to find the answer to questions on the computer by reading their textbook passages. This slightly confused me. I did not see how this example fell into the collaborative learning which focused on “students working with other rather than with themselves”. In this classroom students were separated, quiet and worked only with themselves in order to answer their own set of questions that they were given. This was not engaging at all. The students were completely on their own and were not able to discuss or help other students. Most of the other examples showed to class and teacher engaging in a lesson and using technology to allow everyone to be a part of the lesson. This example shut the students off from one another and did not seem to take any information that they were given and put it into real world context. I have seen many different types of technology with teaching. In college, for example, we had iclickers. These were used for pop quizzes and attendance in large classrooms. It allowed for the students to answer the quiz questions or daily question anonymously, but allow for all the students to be present and engage in whatever activity we were learning. I have also seen many special education teachers use smart boards to allow for their students to be involved in their lesson. 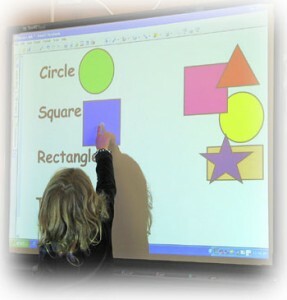 One special education teacher would do almost all of her lesson on the smartboard as a way to engage her students and to involve them In every aspect of their learning whether it was reading stories and using the markers for the smartboard to have the students highlight sounds and words, or as a way to have students practice math in front of the class. Teachers and principals could likely take the data reports of teachers who bring about higher achievement with bad taste. Teachers and principals may view these findings as inadequate to their specific school or students within their classroom. Teachers might think that higher achievement only means that standardize test scores are higher, and not taking into account the student as a whole, outside of standardize tests. Not only is the data perhaps not showing all areas of a student – a problem on why principals may be reluctant to use the data- but it most definitely degrades the other teachers. These teachers deemed as those who are not bringing higher achievement may believe, due to the data, that they are not good teachers, and no longer have the moral support so desperately needed in order to be a successful teacher. With these findings the Principal of the school may not want to share the results in order to keep the community of the teachers solid, rather than disrupt it with another critical report. It also seems that man of the reluctant principals may not be willing to show the data reports because of the lack of “essential” data. Principals and school administrators may believe that it is not the teachers who are making the students underachievers. Instead the administrators may look to the “old notions about the causes of underachievement” (Haycock, 2000) which may place emphasis on family situation, income of the family, education of the parents and family, friends, and etc. The reports may not include all of the pertinent data the administrators think also may affect the students learning and their goal for wanting to achieve more. It would be better for the principal(s) to address the teachers after they have been supplied with the data report. By letting the higher achievement teachers mentor the lower achieving teachers, in order to show them how they conduct their classroom and lesson, but to leave out the report as to not have low-esteem within the teachers. As a high school student I was not as interested in how my teacher mattered in helping me succeed. I believed that the teachers were there to help guide me in the right direction, but that my test scores and scholastic achievement were up to me. I knew that the teachers were there to help me, but none of them said outright “Heather, I can help you achieve this”. It was more as if I should have known that the teachers were there to help, but I should do it myself in order to look as if I understood the subject. I do not believe that friends knew of this, or majority of the school. It is not made as clear today, like in the video, that teachers do matter in how students’ lives turn out. It seems as if more influence is place on friends, and family to how the students achieves. Upon watching the video and reading the first chapter of “Foundations of Education” and our class discussion I think it is important that teachers are knowledgeable of their subject, have a strong community of new teachers and seasoned teachers, have a relationship with the administration, care about the students and are willing to show the students their potential, and to make sure the students know that the teacher is there to help in any way possible. I believe that teacher empowerment, (Ornstein, Levine, Gutek 2011) is a great idea that will really help teachers feel comfortable in dealing with situations and feel as if they have a community to look to for help. You are currently browsing the of a beautiful mind blog archives for January, 2013.